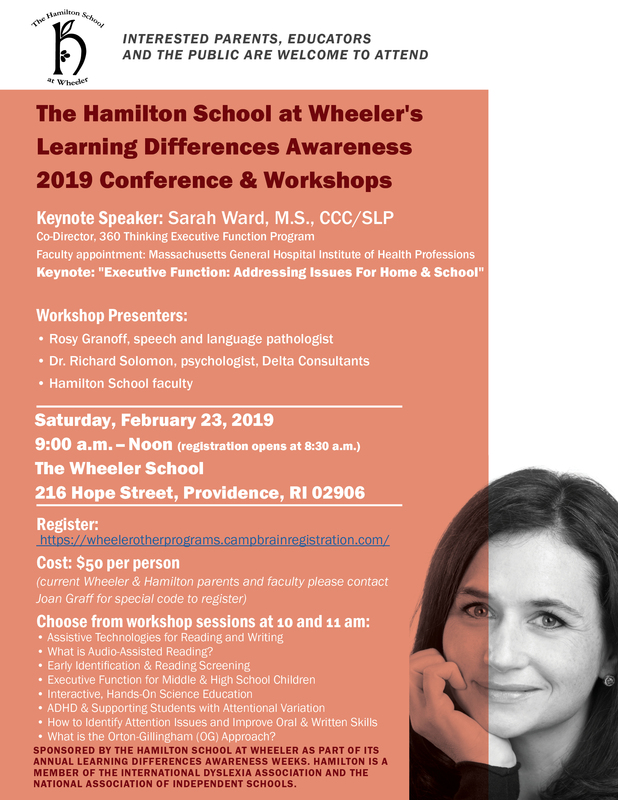 Experts in the topics of executive function, assistive technology, ADHD and ways to address learning differences at school and at home will present workshops at the 2019 Hamilton School at Wheeler Learning Differences Awareness Conference on Saturday, February 23 from 9 am to noon at The Wheeler School in Providence. Sarah Ward, M.S., CCC/SLP, co-director of 360 Thinking Executive Function Program, will present the keynote: "Executive Function: Addressing Issues For Home & School." Download the conference flyer here. Parents, educators and the public are welcome to attend. The conference fee is $50 unless you are a current Wheeler/Hamilton parent (current parents please contact Joan Graff at Hamilton for your discount code). Register here now.